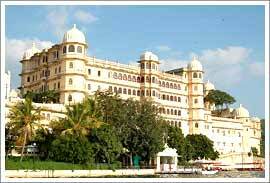 Udaipur city is one of the most popular destinations not just on the map of Rajasthan but entire India. It abounds in stunning palaces and the City Palace is the most beautiful amongst all. Overlooking Lake Pichola, the City Palace is an architectural marvel reflecting the glory of the bygone era. The palace is an amalgamation of Medieval, European and Chinese architectural styles. Its foundation was laid by Maharana Udai Singh but over the years his successors made brilliant contribution to it by adding several new structures. And yet the palace does not have any flaw when it comes to uniformity. The towering main entrance of the palace is called Tripolia, a triple-arched entrance. The other main gateways are Hati pol and the Bari pol which lead to the Tripolia gate. City Palace is the largest palace complex in Rajasthan. It is a wonderful assortment of palaces, courtyards, corridors, pavilions, terraces, rooms and gardens. Stroll in the balconies of the palace and you will be rewarded with picture-perfect views of Jag Niwas (the famous Lake Palace hotel), Jag Mandir (island palace) and the blue city Udaipur. Saraj Gokhda is the place where the erstwhile Maharajas would come to offer encouragement to the assembled people of his kingdom during tough times. The Mor-Chowk (peacock courtyard) is very lively as its walls are festooned with bright mosaics of peacocks in glass. The Bhim Vilas abounds in beautiful wall paintings of Lord Krishna. The Sheesh Mahal shimmers with stunning mirror work. Other noteworthy apartments inside the complex are Dilkhush mahal, Manak mahal, Badal Mahal, Moti Mahal and Krishna Vilas each having distinct charm. The palace also has a battlefield where elephant fights used to be organized for the enjoyment of the ruling classes as well as the masses. Jagdish Temple is another attraction in the complex. It is the biggest and most fascinating temple of Udaipur. Laxmi Vilas Chowk is an art gallery boasting of a beautiful collection of Mewar paintings. Amar Vilas is set at the highest point of the palace. It has manicured gardens with fountains. The Zenana Mahal (the chamber of ladies) has now been converted into a museum displaying weapons sword, miniature paintings, high-quality cotton, silken brocade, muslin and necklaces, belts, rings, bracelets and anklets of the then Queens.